Our Chester minibus hire is the ideal way to get your business team, family or community group to any venue in the area. We are highly regarded for our punctuality and arrive to transport you home at least half an hour before the scheduled time. We give you a call before we reach your location so you will know we are nearby. We can take you to any destination in northwest England, not just around the city centre. So, if you are visiting Chester and want to partake of delicious dishes in restaurants outside of the old city, call us first. Our Mercedes 16 seater is one of our most popular buses for small groups. Mercedes Benz is known for quality and their luxurious styling. These sleek buses are ideal for transportation to weddings, graduations and nights out with friends. Tinted windows make it easy to enjoy the ancient Roman architecture of the city on sightseeing tours. If you plan to play golf with friends and want to take a quick nap before you arrive, adjust your seat and play relaxing music while you travel. While small vehicles are comfortable, sometimes our groups need more space. This is where our clients often request our Volvos and Iveco coaches. 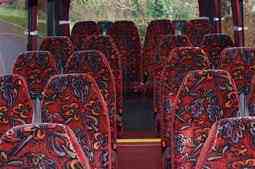 If you have a group of 70 people or more, a 72 seater may be ideal for you. 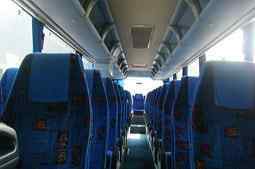 We have 53 seater buses as well, which carry all the amenities that our Chester minibus hire is known for. This gives you the comfort and flexibility which is associated with our fleet but allows you to stay within your budget. Large buses are fitted with amenities which make long trips easier. Hot and cold drinks facilities on board make it easy for you and your team to feel refreshed during your journey. Overhead lights make preparing for a meeting easy. Our PA system can be utilised whenever you need to communicate ideas effectively and we have a range of audio visual tools so you can play films which are relevant to your trips. Reminisce on old times during trips with family members or review the progress that your business has made throughout the year. We have very small buses which are perfect for groups which consist of less than 10 people. This is a good option for people who want to get to a meeting, an anniversary dinner or catch a concert. This is also a popular option among people who are planning a stag do or hen do and want their closet friends to be there. 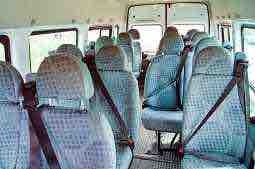 An 8 seater from our minibus hire in Chester can take you to popular nightclubs in comfort. Call us today and find out more about our affordable options for small groups. Many of our clients enjoy visiting Chester because of its beautiful Roman architecture. It was once a roman fortress and the buildings in the ancient city were built to last. Many still remain to this day and provide great photo opportunities for visitors from all around Europe. While day tours of Chester can be fun, several people look forward to enjoying all that the city has to offer in terms of nighttime entertainment. If you wish, we can help you to arrange a hen do, birthday party, stag do or another celebration. Our minibus hire in Chester can take you to great night spots, many of which retain architectural elements which have helped to make Chester famous worldwide. We can pick you up at any time of the day or night in our luxurious Iveco coaches. If you want to celebrate your special day with friends until the wee hours of morning, you can rely on us to pick you up when you feel like going home. With our experienced drivers taking care of you, assigning a designated driver will never be a concern. Visit our website and book your trip today.